Yesterday was about characters and blogging basics. I didn't really have much to put in other than a late Instagram post. This book was a life changer for me. Why? The characters. If you haven't read this or any Steinbeck novels, do so. Sooner, rather than later too. Anywho... today is about books that become movies, or even tv shows. For me, I have told the world I want too see The Lunar Chronicles made into something visual and on-screen. It would seriously be the one thing I would pay money to go see. 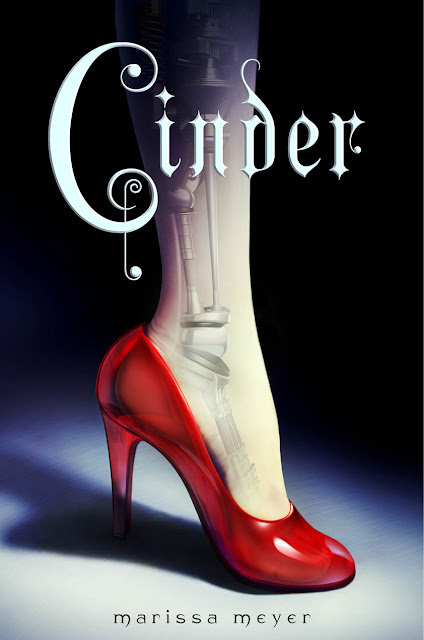 Because of my love of this series by Marissa Meyer, I have decided to offer up the first book that starts it all, Cinder, for giveaway. US readers vie for an ecopy. CDN readers vie for print. Both delivered straight from Amazon. YAY! Sorry to my international readers and ABEA readers, them's the breaks when my wallet is only so deep. I hope whoever wins, loves this book, and series, as much as I do. **No compensation was received for posting. Opinions and photos are owned by this site. Freda's Voice is responsible for prize shipment. Freda's Voice is not responsible for lost, stolen or damaged prizes. Nice give-away. I don't qualify so good luck to the others. Thank you for the giveaway. Love this book! I'm woefully behind on Steinbeck. I need to get on that. Great choice of book to giveaway! Not entering the giveaway as I have this one. I adored it and would love to see this series as movies. They'd be every bit as great as Hunger Games or Divergent! Maybe better???? Yes, I'd like to see Cinder on the big screen too. The special effects could be amazing. I read East of Eden a few years ago. It really hit me. I especially loved the concept of timshel. I'd like to see what would happen with Geralyn Beauchamp's Time Masters series taken to the screen. I know enough to know she keep her hands in what was going on with it so as to avoid certain Book to Movie blunders and she also knows a bit about screen writing so could probably edit the basic bones even. I think Cinder would be great to see at the movies! I think Cinder would make a great movie. Also, Across the Universe by Beth Revis.